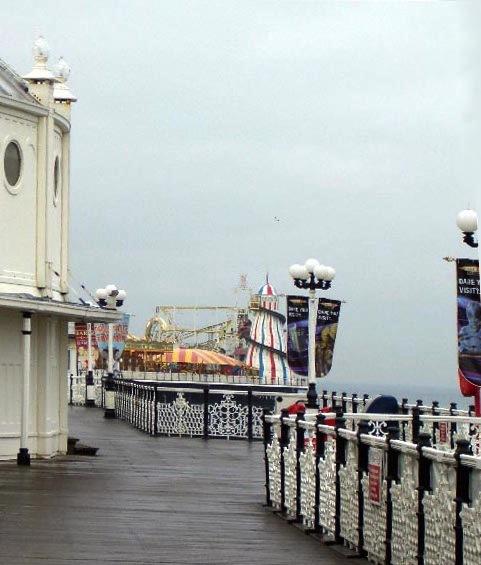 Brighton Palace Pier (the word "Palace" has recently been restored to its name), seen here from the promenade looking east. 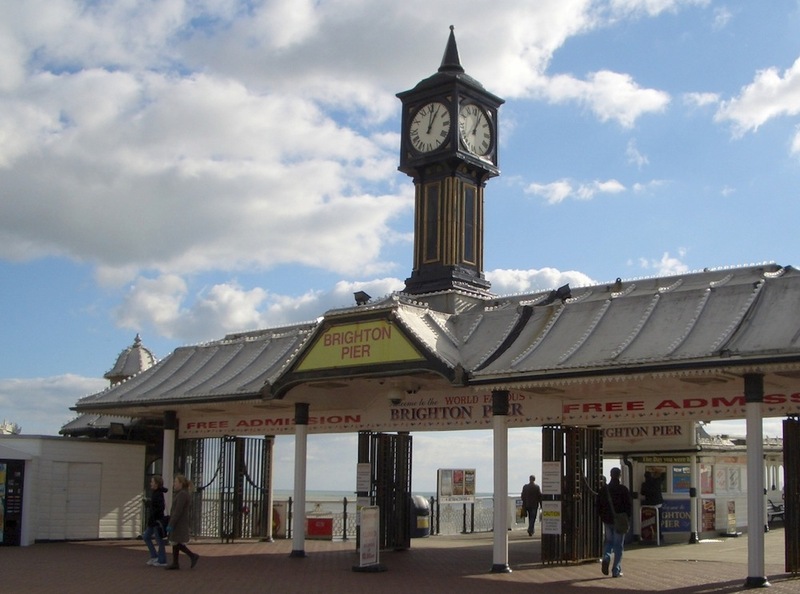 This iconic Grade II* listed pier was designed by Richard St George Moore (1858-1926) in 1891. There were two other piers at that time. One was the old Chain Pier nearby, which was to be dismantled, but instead was almost entirely destroyed by a bad storm in 1896. Parts of it were sent crashing into the new project, considerably delaying completion. The other pier was the ill-fated West Pier, irretrievably damaged by storm and arson attacks in the early twenty-first century. As for the existing pier, shown here, work on it continued from 1898 at the expense of the Jewish civil engineer and philanthropist Sir John Howard (c.1930-1917), and it was officially opened in 1899. Since it was not yet complete, the ceremony was focused on fitting into place the first column of the seaward-end pavilion (see Dobraszczcyk 162-63). The pier was finally completed in 1901, although it still had not taken the form in which we see it today. This is what it looked like in the very early twentieth century, in a photograph taken from the other side, looking west. 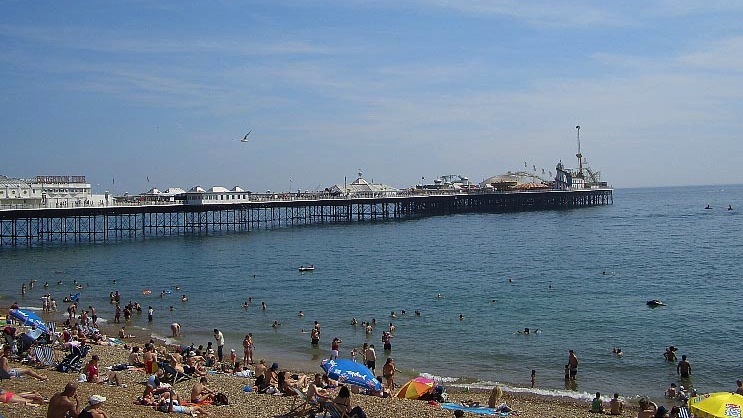 The structure to the left of the pier is the Brighton Aquarium as it was then. Source: Jerrold, facing p. 24. While the new pier remained fundamentally a Victorian project, there were important later additions, changes, repairs and restorations as well. Originally, for example, the entrance structure was composed of three cast-iron arches. These were much lighter in appearance than the present mansard-roofed structure of 1930 (seen on the left below — the clock here now is a post-war replacement of the one taken from the adjacent Brighton Aquarium, when the entrance was rebuilt). 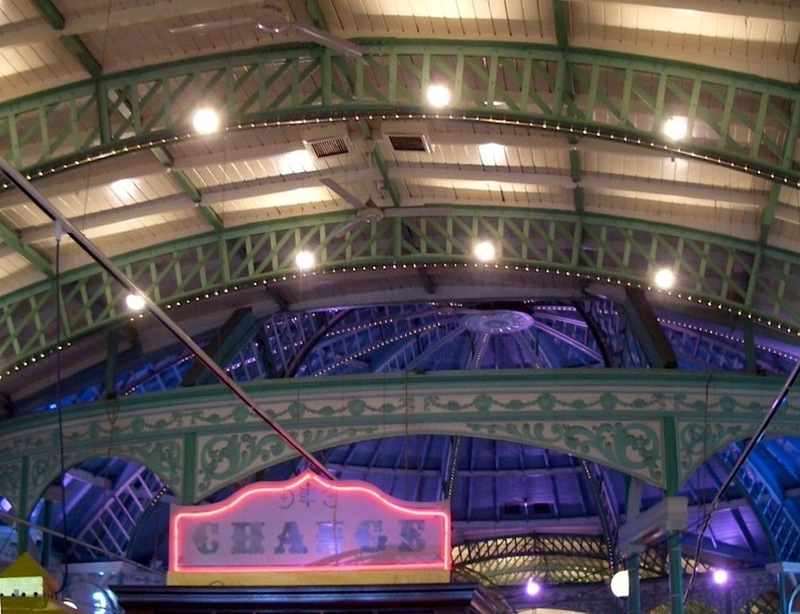 These arches were echoed in the series of cast-iron arches that still continue to span the pier for most of its length, and carry many of the light-bulbs used for evening illuminations. But they are less noticeable from a distance now because of more recently added stuctures. 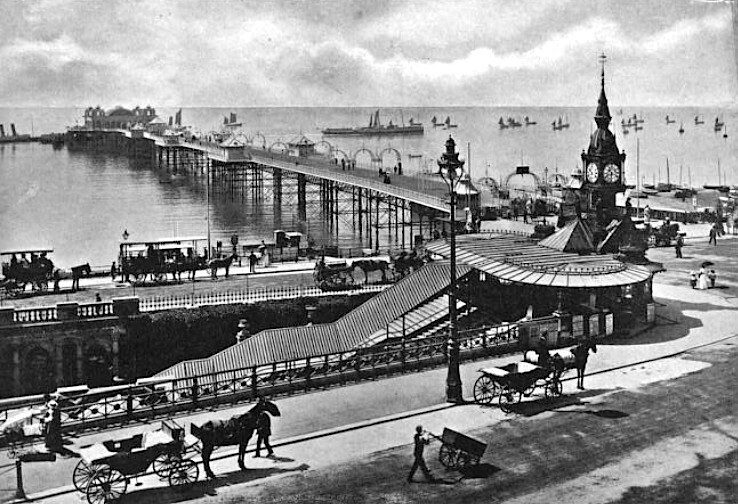 In those early days, the only large structure to be encountered would have been at the very end, as shown in the historic photograph on the left — the pavilion that opened in 1901 as the Palace Pier Theatre. This pavilion is described in the listing text as having been "girded by Moorish arcades" and sporting "a very exotic interior," with seating for an audience of 1,800. Like the West Pier, it must have taken its cue from Brighton's even more exotic Royal Pavilion. It also had other facilities, including a reading room and restaurant. But the heavy structure seemed precariously perched out there, and indeed was badly damaged by a barge in 1973, and finally demolished in 1986. The other large structure which is not seen in the historic photograph, because it had not yet been built, was a large Winter Garden nearer the entrance. 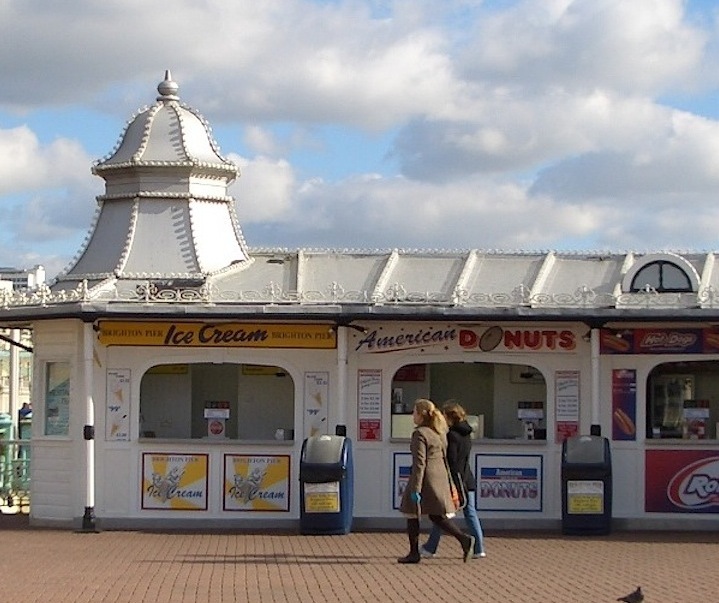 Completed in 1910, this remains today, and has become a "Palace of Fun" — that is, an amusement arcade. Left to right: (a) The entrance to the pier. (b) Looking along the pier towards the helter-skelter. (c) Ironwork on the pier. 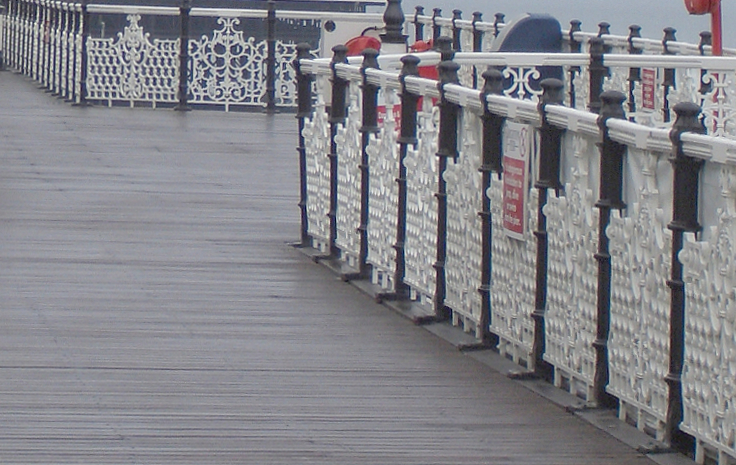 The materials of the pier are steel, cast- and wrought-iron, with kiosks, shelters and other structures of wood and metal, including the ironwork arches. Along the middle run ranges of glazed wind-screen. According to the listing text, it is 1,650 feet long (sources do vary a little), and 189 feet wide at its widest point, at the end of the pier; it covers altogether 2.5 acres (see "The Palace Pier"), and required 85 miles of planking for the deck (see Hymans 14). The funfair at the end replaced the large theatre, and a tall helter-skelter stands out here like a lighthouse. Shown above right is some of the original ironwork. Left: Roof of the main pavilion, looking towards the east side. Right: Roof showing the central rotunda. 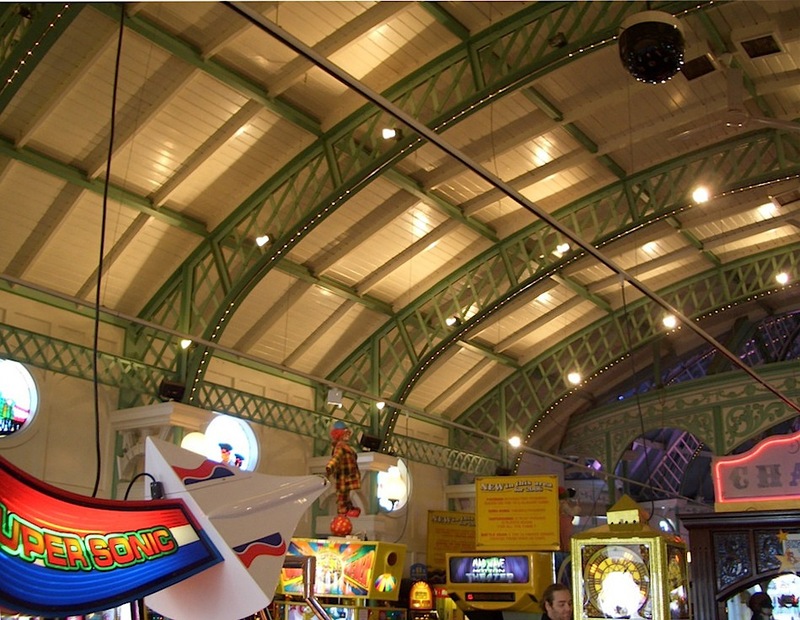 As noted above, the pier's largest structure is now an amusement arcade. The listing text explains that this too was "designed in a Moorish style to echo the Royal Pavilion" with "a low rotunda at the centre with rectangular, nave-like structures projecting from the north and south to form a central axis on line with that of the promenade." Inside, cast-iron columns support "an open web, single-span metal truss which takes the form of segmental arch; the ceiling is boarded." Similar but higher columns support the rotunda. This could never have been a match for the old end-of-pier theatre, and is tawdry enough now, but it gives some idea of the kind of fantasy-land intended. The pier has always been a major attraction for visitors. Looking at the pier pavilions from the eastern side. Two rows of kiosks, one on each side of the entrance, form a semi-circular forecourt. Like the clock, the domed parts at the ends came from the Aquarium: one of them can just be seen to the left of the clock, then in its original position and with a more elaborate "spire," in the historic photograph above. "Death Of Sir John Howard." The Times 21 April 1917: 3. Times Digital Archive. Web. 24 April 2018. Hymans, Mike. Brighton Remembered: A Pictorial History. London: PublishNation, 2015. "The Palace Pier." Historic England. Web. 24 April 2018. "The Palace Pier and Theatre, Brighton." ArthurLloyd.co.uk. Web. 24 April 2018.